In a conversation yesterday, a friend mentioned that he had, over time, developed an appreciation for Chinese opera. "That's great," I said (while my thoughts said "Howling cats!"). My knowledge of Chinese music is admittedly limited; some throat-singing from the regions near Mongolia and Tuva, some traditional erhu artists, a women's drumming group, and of course the saccharine-laced Twelve Girls Band. My appreciation for Chinese music has taken a great leap forward (if you will) with a new, very fresh album by Shanren, a group from Yunnan in China's southwest who are doing for Chinese folk what Deleon is doing for Sephardic Jewish melodies and Tinariwen is doing for Taureg tunes. Indeed, there's a common thread in these three traditions of struggling cultural minorities fighting for their traditions and, not infrequently, for their survival. 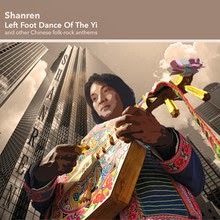 Shanren, the liner notes relate, draws inspiration from classic Western rock bands. Reading deeper into the musical marriage of the two genres, the band came to see the outcast position of Chinese rock musicians as a mirror image of the Yunan tribes' struggle for cultural identity. Early Chinese rock and rollers were considered to be on the fringe by members of the mainstream Chinese machine and so their sounds were drowned out by the louder, brasher conventional pop music pumping out of urban cities. Following the opening track "Wandering," which reflects the album-making process of traveling to the remote areas of Yunan to learn songs and instruments, the album shifts firmly into rock mode on "Thirty Years," with sparkling bass work and solid drumming that manage to leave plenty of sonic space for the traditional stringed instrument that takes the lead (the four-stringed lute called xianzi, I believe). Other tracks range from the rap-like traditional greeting on "Song of the Wa," to the reggae-flavored "The Crab," to "Happy New Year" -- which starts off sounding like the Red Hot Chili Peppers getting drunk in a Yunan karaoke bar before segueing into a melancholy ballad, then into a manly chant. "Left Foot Dance of the Yi" may just be my favorite Chinese-language album since I discovered the folk-rock protest songs of Taiwan's Labor Exchange Band. And it's a great bridge album for those who may find more traditional Chinese music somewhat, um, unpalatable.